Distributions on winding up: have your checked the TAAR? If you have received a dividend during a company liquidation since 6 April 2016 it is vital to check the TAAR conditions before you submit your tax return to HMRC. The Targeted Anti-Avoidance Rule (TAAR) applies to certain distributions on winding up. If the TAAR applies, dividends received on the liquidation of your company do not automatically attract CGT treatment, instead they are taxed as normal income dividends. The TAAR specifically targets the practice of 'phoenixing' a company to avoid tax. Phoenixing describes closing down a company and then re-starting a nearly identical new company. This practice was being used as a way of extracting funds as capital. It may also be used for non-tax reasons, i.e. as a way of avoiding creditors or to restart an existing trade via a 'clean' company if the old one had reputational issues etc. The TAAR must be considered each time a distribution is made during the winding up process. As a former shareholder or even director, it is highly likely that HMRC will deed you to be careless if you fail to check the rules. The Transactions In Securities rules may also need to considered in respect of distributions made during a winding up. The TAAR legislation is complicated. It took one leading writer the lenght of four articles to cover the new rules. We of course have a written our own guide to the TAAR. If you are short of time and to assist you further, our Virtual Tax Partner service has created a TAAR tool which takes all the pain out of checking this important rule. 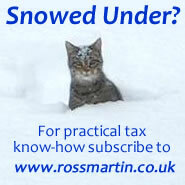 If you are a subscriber to www.rossmartin.co.uk we invite you to beta test the new tool. We estimate that this tool will save the average non-tax-specialist somewhere between around three to fours hours of research time. To join please raise a support ticket on www.VtaxP.co.uk with TAAR tool in the header. This is free of charge, as we are testing.